Just days before the July 4th holiday, 25 international teachers whom Baltimore City Public Schools recruited to fill hard-to-staff positions will be forced to leave the country after the federal government refused to extend their work visas before they expired. Months ago, the school district applied to extend the international teachers’ H-1B visas — a program that allows employers to hire international workers with skills they can’t find in American candidates — but learned in May the applications were held up for an unusual audit. The review will take an additional six to eight months — long enough for the educators’ visas to expire, forcing them out of a country some of them have have called home for more than a decade. Grant-Skinner said the Department of Labor has not told the district why it is holding the applications for an audit. He said it’s the first time the district has faced a forced departure of its educators in over a decade of dealing with visa applications for Filipino teachers, and that district officials can only speculate as to why it’s happening now. “We can only guess. But given our experience in the past, it does seem that something has happened at the federal level to cause this to take longer than usual,” Grant-Skinner said. In a June 21 letter obtained by The 74, Baltimore school district CEO Sonja Brookins Santelises informed her colleagues of the teachers’ fate. “Needless to say, everyone at City Schools is deeply saddened by the loss, for any length of time, of these talented, dedicated educators, and by the knowledge that they will be forced to leave what many consider to be their homes after all of this time,” Santelises wrote. 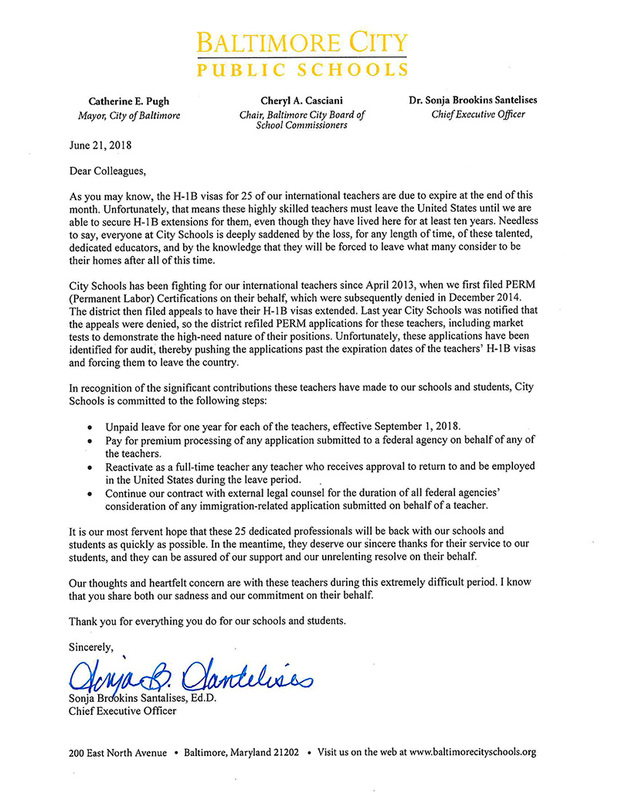 In recognition of their contributions, the letter indicates the district will offer the teachers unpaid leave for one year and pay for expedited processing of future applications, and will rehire any of the teachers who get permission to return to work in the United States. The district has been fighting in vain for five years to extend the teachers’ visas and offer them permanent employment. 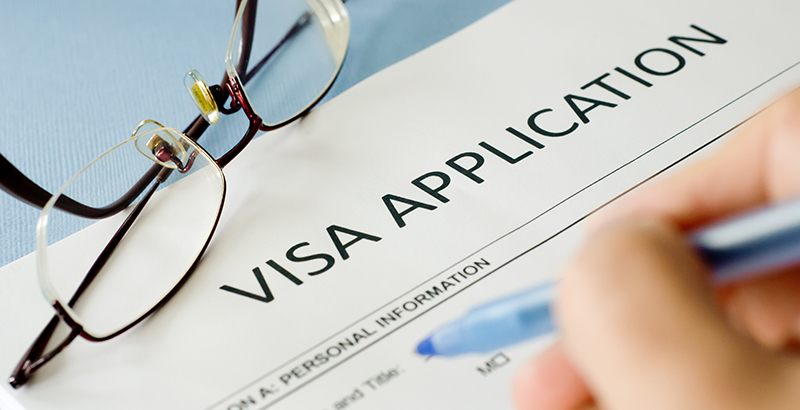 Problems began in April 2013, when the district first applied to offer the educators positions that would allow them to remain permanently in the U.S.
After the government denied those requests in 2014, the district asked to extend the visas, which are typically good for three years. That request was denied as well. And when the district filed again recently to allow the teachers to remain permanently, the government flagged the applications for an audit. Earlier this month, five Democratic members of Maryland’s congressional delegation asked U.S. Secretary of Labor Alexander Acosta to take action before the teachers had to leave the country, The Baltimore Sun reported. “It would be a loss for the Baltimore community and undercut the ability of City Schools to provide a high-quality education in important academic areas that prepare students, including those with special needs, for in-demand jobs,” they wrote. The efforts appear to have fallen short. Several of the teachers have already left Baltimore, and the rest must do so before July 1, Grant-Skinner said. The Baltimore school district currently has 250 international teachers, many recruited from the Philippines. A documentarian, whose film The Learning premiered in 2011, chronicled the trek of several teachers from the Philippines, where an English-speaking school system modeled after America’s makes the country an ideal source of educators. Baltimore isn’t the only district that’s looked abroad to help fill hard-to-staff positions. Los Angeles has 25 teachers with H-1B visas. Denver Public Schools currently sponsors 130 teachers under the program. And Dallas Independent School District employs 250 such educators. The districts’ spokespeople said most were recruited to help meet the demands of bilingual education programs. Employers who want to sponsor foreign workers on H-1B visas must show they’ve tried and failed to find qualified American teachers to fill the roles. In 2012, the Sun reported that the Baltimore district had conducted a so-called “market test” that showed hundreds of American teachers had applied for the positions occupied by foreign teachers — a rationale Trump has used to call for a crackdown on the visa program. But Grant-Skinner says the district has not been able to find American candidates with the same skills. “We have historically had vacancies in high-need areas in the district, so to suggest that we have plenty of high-quality applicants and that we don’t need to recruit from all available sources is just not true,” he said.